For people who follow vegan and vegetarian diets or for people who want to avoid consuming animal-based products choosing a protein supplement can be a challenge, given that most products available today make use of animal- or dairy-sourced proteins. 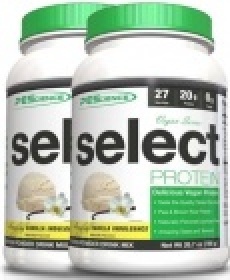 If you are on the hunt for a plant-based protein supplement, the answer is none other than PES Select Vegan Protein! 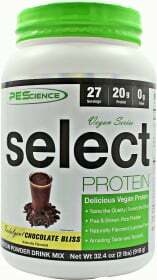 PES Select Vegan Protein lets you meet your advanced protein requirements with its combination of pea protein concentrate and brown rice concentrate. This blend of pea and brown rice protein results in an amino acid profile that closely resembles that of dairy and egg protein – allowing you to enjoy amazing muscle-building and muscle-strengthening results! PES Select Vegan Protein makes a good addition to your diet if you are trying to lose weight as it only contains less than 10g of carbohydrates and less than 1g of fat per serving. Unlike some plant-based protein shakes out there, PES Select Vegan Protein is carefully engineered to taste absolutely fantastic! Get your daily dose of vegan-friendly protein in a rich-tasting and creamy shake... try PES Select Vegan Protein today! WARNINGS Select Vegan Protein : Use this product as a food supplement only. Do not use for weight reduction. Do not use if you are pregnant, lactating or under the age of 18. Discontinue use and consult your health care professional if you experience any adverse reaction to this product. Store in a cool, dry place.